branching out: i’m sure it’s ubiquitous for a reason and i just can’t think of a better use for the measley 100g of black alpaca i’ve yet to spin. have been working up to it and i think a fine singles will be the way to go. i’ve been practising with different preparation techniques. while joanna may be able to spin the stuff just flicked open i’m just not skilled enough to do that and turn out a yarn i’m anywhere near happy with. i’ve carded the flicked fibre and spinning from those rolags is a joy, but i’m going to experiment with just carding and see how well that deals with the vm. i found with flicking the locks i lost a lot of fibre i.e. 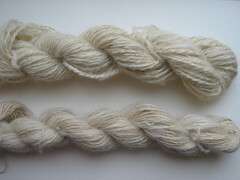 my final skeins weigh in at just under 70g from 100g of raw fibre. it would be nice to think that i can skip straight to the carding stage and save prep time as well as be able to use all the tangly fibre that gets discarded when you flick and try to keep the locks intact. i really need to find an efficient processing method since i have a large amount of raw alpaca winging its way to me as i type (i hope). i might find out if it’s possible to widen branching out if it turns out i get 75g plus out of 100g.